Year 313 (CCCXIII) was a common year starting on Thursday of the Julian calendar. February 3 – Edict of Milan: Constantine the Great and co-emperor Licinius give religious freedom for all. They end the persecution of Christians in the Roman Empire. Emperor Maximinus II fights at Bosphorus. 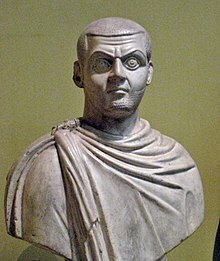 April 30 – Battle of Tzirallum: Licinius defeats his rival Maximinus II. He becomes Emperor of the Eastern Roman Empire. Maximinus runs away to Nicomedia and commits suicide. March 14 – Emperor Jin Huidi is killed by Liu Cong, ruler of the Xiongnu state (Han Zhao). Crown prince Jin Mindi, age 13, becomes the new emperor of the Jin Dynasty. Basilica of Maxentius and Constantine (Basilica Nova), Rome, is finished. Constantine I and Licinius accept Christianity. October 2 – Lateran Synod: Donatism is made a heresy. Arius preaches of the human nature of Jesus.